Christmas tourism is all about attending the markets. All the locations P&O ferries can take you to have famous markets. 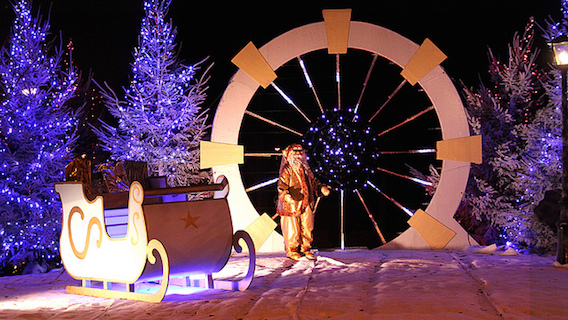 Should you choose to sojourn across the Channel to France this December you’d be hard pressed not to come across a festive fair. France makes for an especially delightful winter getaway whether you want to buy presents, gourmet cheeses, go antiquing or bring back a particularly fine vintage to open on Christmas Day. One of the largest Christmas markets to attend in France is also the one with the oldest traditions. The Strasbourg Christmas market attracts over 2 million attendees and runs for five weeks from 28th November to New Year’s Eve. 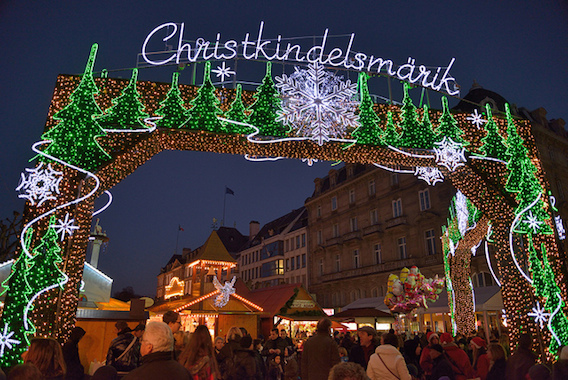 It boasts a unique attraction as ‘the’ original christmas market in Europe – dating back to 1570 when Christkindelsmarik ‘the market of the Infinite Jesus’ was first held. This is a major cultural event – the market is essentially the christmas capital in Europe. 300 chalets spread across 11 locations are open to ply their wares and spread good cheer. 500 separate events are scheduled to keep the crowds entertained and you’ll definitely want to make pilgrimage to the centrepiece a 30m Christmas tree at the very heart of it all! Another historic festive event in France is the Festival of Lights in Lyon. This tradition began on the 8th December 1852 when the townsfolk lit candles at their windows to celebrate the raising of the statue of the Virgin Mary. This is now a major tradition that’s been expanded to delight the attendees of the four day event who come in droves. 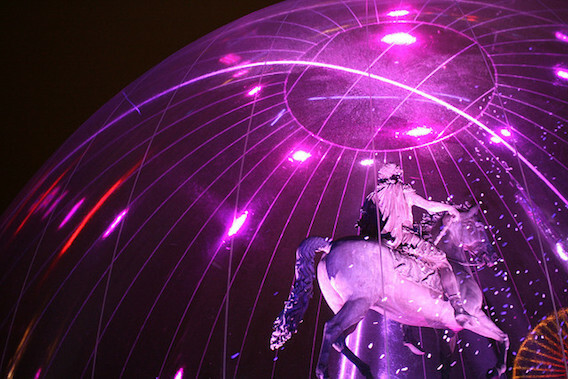 For four nights light artists present over 70 displays of their craft to illuminate the city. New talents have had their first chance to be put on the grand stage and even if you are new to light art it’s easy to be overwhelmed and astounded. The Fragrances if Winter Christmas Market in Amiens is one of the largest in north France. Its focus is mainly on gastronomy gathering the best foods from Frances winter cellars – cheeses, meats and wine galore that alone will make it worth the trip. This market opens at the end of November running through to 31st December. Amiens is a welcoming city and the festival brings out the best of it all. There, of course, will be plenty to draw you in to the Christmas spirit from illuminations, carolling and ice skating. The kids will also be able to make the most of it at the big fair ground where all the best sweets can be found. In the mean time you can peruse the 130 chalets selling gifts and unique decorations for you to set up when you get back home. Our third recommended Christmas market is in Arras. It will take a few hours drive through the French countryside but you can bring your car on the Ferry to fill up on festive goodies to make the trip back to Calais less of a chore. The market opens 28th November and runs right through to Christmas Eve. It will absolutely be worth the trip with one of the finest settings in Europe. Arras’ Grand Place is an architectural marvel – when there’s a chill in the air and a bustling festive crowd you’ll find that Christmas spirit guaranteed. The market will play host to 90 exhibitors with a pedestrian district opened up for Christmas tourism. The Arras Christmas market packs in all the fun with fairground rides, carousels, ice skating and live music. If your planning to spend Christmas in the comfort of your own home but want to get to France come the new year then one of the first events worth crossing the the Channel for is the International Fantasy Film Festival in Gerardmer. This happens once a year during the last week of the month, this year near 35,000 spectators were in attendance for its 10th anniversary. You need not be concerned if your French is a little rusty, the Fantasy Film Festival is intended to broaden horizons showing a diverse selection of films their original language with subtitles. Its focus is on European and Asian cinema by less well known directors, the meet and greets and talks help with the development of new talent within the industry as well as to entertain the crowd. There’s lots to see in between shows, the festival attracts a vibrant audience to discuss new ideas and offer a stage for new perspectives. You’ll see everything from street performances and live music to Indie video game trials make-up competitions and a literary salon where writers get the chance to enhance their scripts.